Television, in the past few years, has in large part catered to terrible people. Anti-heroes are cheerfully celebrated, and shows like You’re the Worst, Difficult People, It’s Always Sunny in Philadelphia, UnReal and so on spotlight the worst of humanity. Morally ambiguous characters rule, and on reality TV disastrous people shine. It’s been repeatedly established that we love to see people do bad. Monday night’s premiere of NBC’s The Good Place—which stars Kristen Bell as Eleanor, a self-centered jerk who finds herself in a heaven-like afterlife known as The Good Place—is the sort of reflective meta-television that makes us laugh at our strange attraction to darkness. There’s no better premise for a show about existentialism than to focus it on death. In doing so, The Good Place gets to mock the ridiculous conceit that people can exist as either bad or good. The beauty is that all the show can really do is ask questions. Within the first five minutes of the pilot, Michael (Ted Danson), a secretarial, guidance counselor-type later revealed as a Good Place architect, explains to Eleanor (and viewers) what The Good Place is and how people who end up there are judged. This glaringly expository one-on-one office meeting serves as our Big Bang for the afterlife world that The Good Place creates and which it’ll gleefully expand upon with each episode. When Eleanor first meets with Michael, she asks what’s on everyone’s minds: “Where am I, who are you, and what’s going on?” She’s dead, and this is the sequel to her life, or as Michael describes it, “the next phase of your existence in the universe.” How she died, both tragic and embarrassing, involves a pack of Lonely Gal Margarita Mix For One. Eleanor, naturally, wants to know if she’s in Heaven or Hell. The twist is that she’s in the wrong place and isn’t who everyone thinks. While her Good Place identity is a Death Row lawyer, in actuality she worked on Earth as a salesperson for a shady drug company. Eleanor isn’t completely deplorable, though far from a saint. Her true self is maybe somewhere in between. Here, though, she’s faced with an opportunity to not be so bad. To help, she entrusts her soulmate and literal moral compass Chidi (William Jackson Harper), a black dude who’s conveniently a former professor of ethics and moral philosophy. 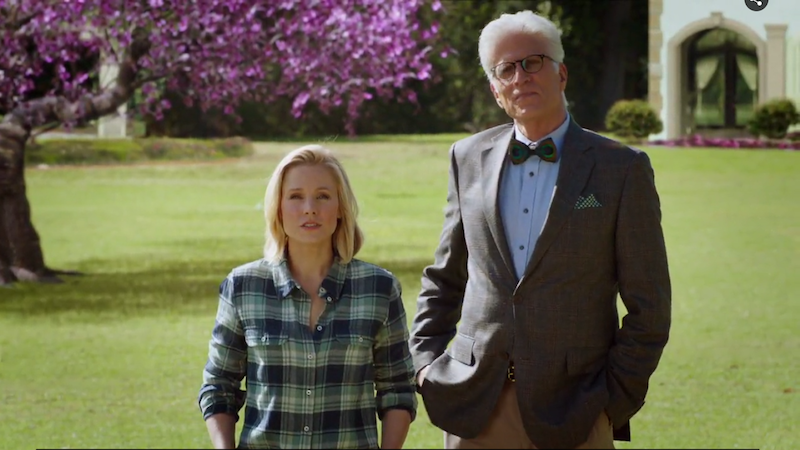 In The Good Place, there’s an eternal soulmate for every person and each citizen lives in a home that “perfectly matches his or her true essence,” according to Michael. Everything about The Good Place is perfect except Eleanor, who notes that she got a colorful small home while everyone else seems to have mega mansions, which is exactly what I might gripe about as a consummate jerk. For the rest of the episode, Eleanor causes unforeseen chaos in The Good Place and decides she has to learn how to be good. Whatever that means. “Is there a pill I can take or something I can vape,” she asks Chidi. Given the conceit, this show has a high potential to lose its charm after a couple seasons—it’s hard to imagine it keeping up the good-bad charade. “These people might be good, but are they that much better than me?” Eleanor asks Chidi at a swank party. Still, the show’s goodness is easy to boil down: it makes me laugh. During the orientation in Chapter 2, Michael teases a tutorial of everyone’s dream “Heaven” activity, which is learning how to fly. The tone is the antithesis of its dark subject matter, but it’s also slightly rough. When Eleanor keeps botching Chidi’s Nigerian name, he’s annoyed but remains straight-faced. In the tradition of shows that focus on death (Dead Like Me, Six Feet Under, Pushing Daisies), Eleanor is plagued with questions about the fundamental mysteries of the universe (“Do you think anybody cared that I died?”). People try to present answers and, in the process, the show passes judgment on both sides. What’s the point of being good? What makes you so righteous for being bad or for ridiculing good? It’s Nice Internet versus Mean Internet. What’s most important is what all of this means, if anything. Probably nothing.